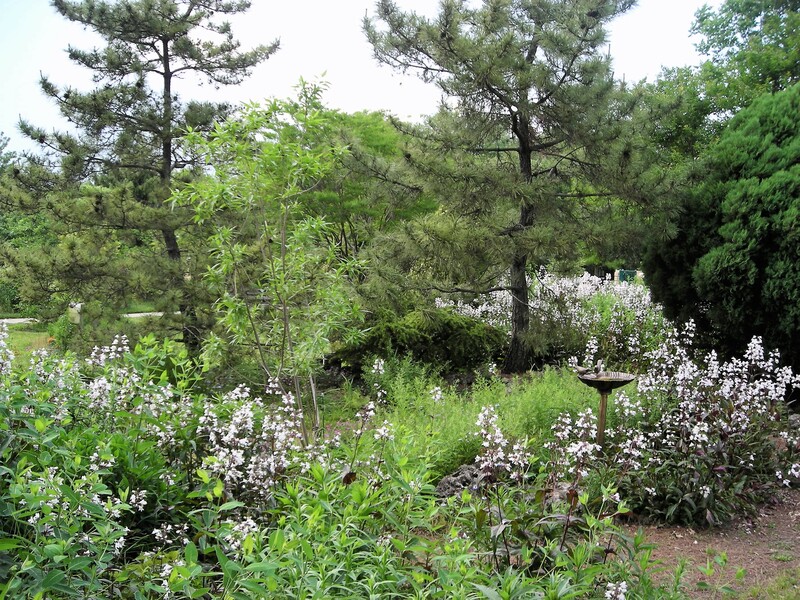 Every year reveals something different about a garden, as the changing weather patterns or the focus of the gardeners’ work emphasizes or favors some plants over others. This year at Simpson, late spring brought great drifts of Penstemon digitalis ‘Husker red’ throughout our Big Berm and adjacent beds. The graceful white bells on dark reddish stems are set off by their deep green foliage. The surrounding somber black pines and the lighter green of other plants combine to please the eye. The mention of “great drifts” and “other beds” is a reminder that this plant spreads readily if not carefully controlled and thinned. Part of the family commonly known as beardtongue, Penstemon digitalis thrives even in drought and is not fussy about soil. 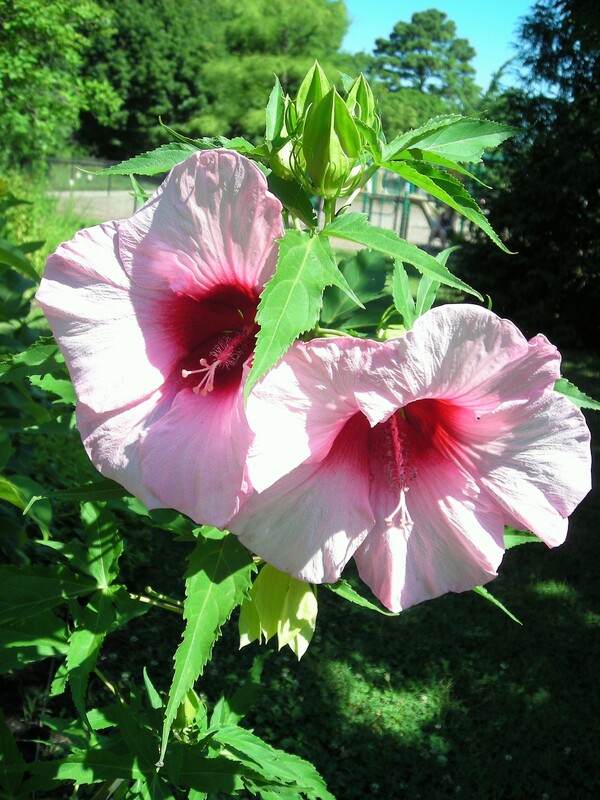 It blooms in late spring, when the bulbs have mostly died away and the summer plants that require more heat to bloom have not yet come into their own. Its flowers attract butterflies, while the handsome dark brown seed heads that follow attract birds and provide visual interest well into late fall. The downside is that they also seed out prolifically – hence the need for thinning or heading at least some of the seeds. On balance, in this gardener’s view, a marvelous plant – but it requires attention to stay within bounds. It was also a good year for hollyhocks, which bloom mostly in our Waterwise Garden. The tall spikes of the pink variety were particularly lovely this year, set off by the surrounding pastels of late spring and the punctuation of the tall red variety that shares the bed. Everything in the Waterwise garden is given added grace by the softly waving swaths of silvery Nassella tenuissima (Mexican feather grass). It calms the sharp purple-blue of larkspur, the biting yellow of yarrow, and complements the soft lavender of Ruellia simplex, also called Mexican petunia. Like the Penstemon, the feather grass spreads all too easily and needs regular thinning. In the hot, isolated traffic island that is home to the Waterwise bed, spreading beyond the margins is not much of a hazard – it is a matter of controlling it within the bed. Nasella anchors the Waterwise Garden. Yarrow, Nassella and Opuntia polyacantha. The Ruellia also seeds and spreads, but so far it is limited in its spread, and we welcome the new clumps in the Waterwise Garden and the little paved Baseball Diamond bed across the way, where it adds softness and color. These southwestern natives have proved their capacity to endure while coping with noxious fumes and heat in these beds adjacent to heavily used parking areas. Back in the Berm, the beardtongue bloom has been followed by a splash of daylilies and black-eyed Susans, set off by the gray-green of a young juniper covered in berries. On the front side, the hot orange of Kniphofia uvaria, red hot poker plant, contrasts with the broad green silphium leaves framing it. And around the corner of that same bed, something entirely different: a tall straight plant with elegantly cut leaves flaunts saucer-sized pink blooms that look to be made of delicate crepe paper. Their buds and fruits merit looking at as well, with the seed heads opening in fall to handsome brown shapes worthy of dried arrangements. Simpson work parties usually take place Tuesday mornings from 10 to 12. Weeding, thinning, and cutting back proceed weekly. Come join us – there’s always something wonderful to see – fennel seeds forming, paw-paw fruits ripening, a new slate stepping stone path in the Berm, an ornamental oregano in elegant bloom. This entry was posted in Simpson Gardens and tagged beardtongue, Hibiscus moscheutos (rose mallow), hollyhocks, Kniphofia uvaria, Mexican feather grass, Mexican petunia, Nassella tenuissima, Penstemon digitalis, red hot poker plant, Ruellia simplex, Simpson Demonstration Gardens. Bookmark the permalink.